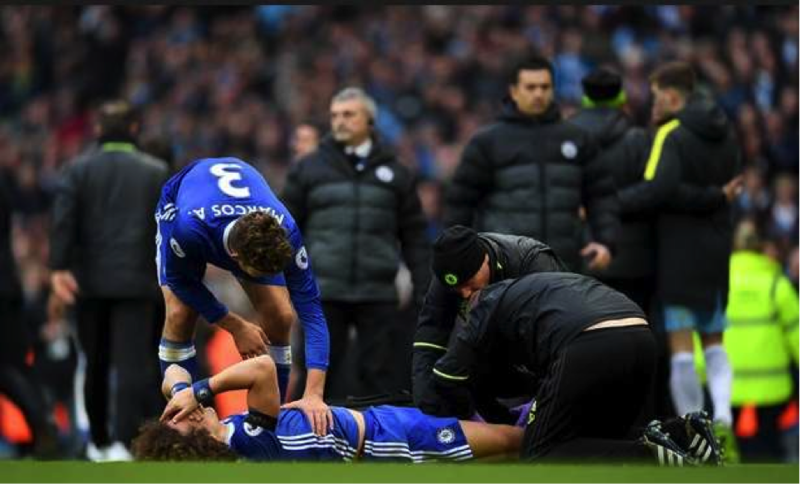 Chelsea and Brazil defender David Luiz is struggling to make it to Sunday’s game against West Bromwich Albion at Stamford Bridge, as reported by Guardian. The Brazilian was the recipient of a bullish lunge by Sergio Aguero last week and if reports are believed to be true, he is facing a late fitness test to prove his fitness ahead of the game on Sunday. Sitting atop the Premier League table, Chelsea completed a marvelous comeback against Pep Guardiola’s Manchester City last weekend. After suffering an early setback in the shape of Gary Cahill own goal, the Blues rallied in the second half to get a much-needed victory. However, what might have been a picture-perfect victory for the Blues was marred by incidents at the end. Starting from Sergio Aguerotackle on Luiz – which earned the Argentine a suspension, there was a brawl in the closing stages on the touchline. In addition to Aguero, another Manchester City player in Fernandinho earned a red card due to his theatrics. Consequently, the Manchester City were forced to finish the game with nine men on the pitch. More importantly for Chelsea, it was the injury to Luiz which might come to haunt them in the long run. In the last twenty days of December, the Blues will play five games in the League starting from Sunday. Thus, with Luiz absent and John Terry still out of action for long, Antonio Conte might be in a fix to sort out his defense for the upcoming barrage of fixtures. Luiz has been central to everything since he got his reunion with the Blues this summer. From being regarded as the major reason for Chelsea’s indifferent start to the season to the catalyst in them going five hours without conceding a goal, the colorful Brazilian has made his presence felt at Stamford Bridge in different ways this season. Another change – though not forced upon, might see Conte picking Willian ahead of Pedro on Sunday. The Brazilian, who scored the second goal for Chelsea against Manchester City last weekend, has merely been a spectator at their bench this season. However, with three fixtures in the next seven days, Conte might be looking to tinker with the starting XI which has mostly remained unchanged this season.